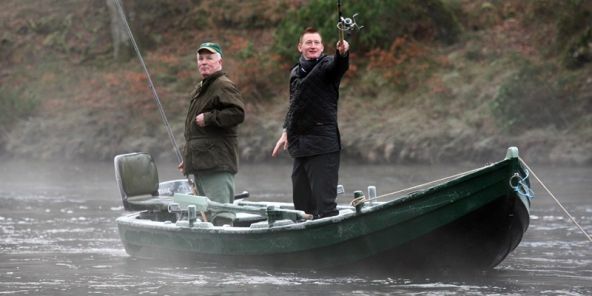 The honour of making the first cast of the year fell to football’s Steve Lomas, the St Johnstone manager. William Jack, chairman of the Tay District Salmon Fisheries Board, said it was a “great day” for all those interested in angling. He said: “At long last those of us who are really keen on angling are allowed to start fishing again. This is the opening of the 2012 season and anybody involved in angling at all is excited about today. Bagpipers led the onlookers from the hotel to the banks of the river, where they enjoyed a dram at the water’s edge. In a further symbolic gesture, a dram was also poured into the river to keep the salmon “in good health”. He said later: “We’ve got something like 3,000 square miles of river here. We hope to attract as many anglers as we possibly can from all corners of the globe to fish. “In recent years, more and more people from Scandinavia have been coming, but it isn’t just overseas fishermen we want to attract. Obviously it’s as many people as possible in the local area and from all age groups. “We are concerned that young people see this as something which isn’t available to them. There’s a suggestion that fishing is perhaps a rich man’s past time. “But we have something like 4,000 rod days available to let just in the next few weeks. Some 50% of them cost less than £30 for a day’s fishing. 95% of them cost less than £65 for a full day’s fishing. So I would suggest that puts salmon fishing in the reach of most people. Come and have a go. The price isn’t going to put you off. The experience will be one I think you’ll enjoy. Explaining the thinking behind that decision, Mr Jack said: “We have some serious problems at sea. “Some 95% of the young salmon that leave this river to feed die before they get back here to spawn, so we’re now down to 5% survival, so there’s really a very serious issue. For more information on the check out this link.